What are the most bizarre diagnoses in medical billing? At Amino, we work with health insurance claims every single day. Most of the time, that means doing important, complex analyses to break down the walls of price opacity and bring choice and clarity to healthcare consumers. But having access to a database of 9 billion claims, a team of curious data scientists, and a copy of Struck by Orca in our office means this particular pet project was nothing short of inevitable. 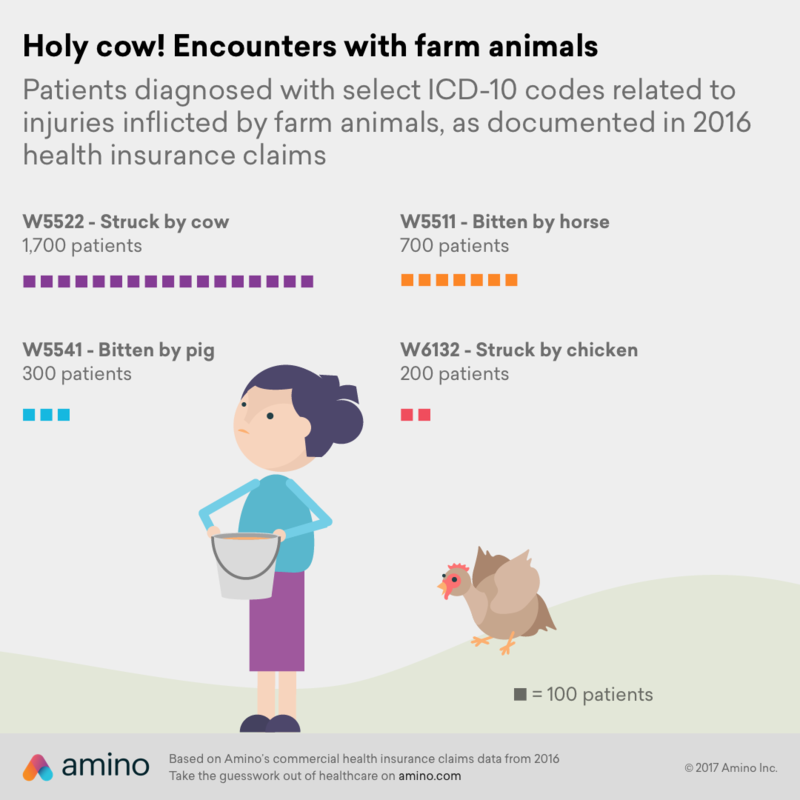 The burning question: of all the bizarre, unlikely injuries described in ICD-10, how many have actually ever happened in real life? In case you’re unfamiliar with the strange, strange world of medical coding, ICD-10 stands for the International Classification of Diseases, the 10th revision of a medical diagnosis classification list developed by the World Health Organization. 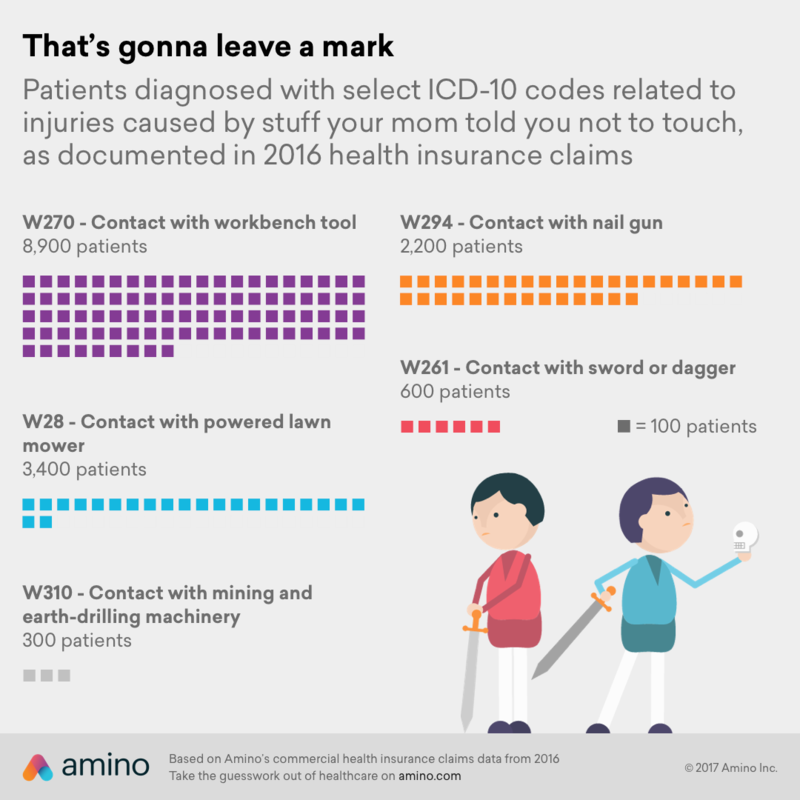 Every time you go to the doctor, your diagnosis is recorded as one (or more) of these multi-digit codes, which cover everything from insect bites to animal-drawn vehicle accidents. To find those ICD-10 codes in the sweet spot of super weird yet plausible enough to actually happen, our data science team looked at the W20-64 category, “Exposure to Mechanical Forces.” For the sake of simplicity, all patient counts are only for the initial encounter (yes, subsequent encounter is an option), and since we care about protecting patient anonymity, we rounded all counts to the nearest 100. Keep in mind: for any of these codes to pop up in our data, someone has to go to a doctor for treatment and that doctor has to record their cause of injury. 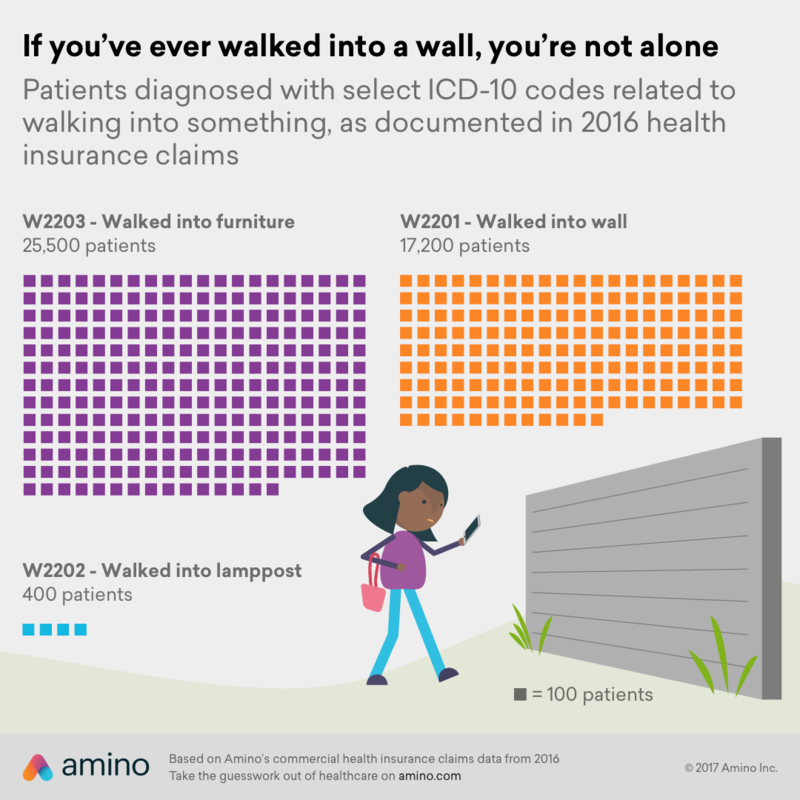 See below for a look at how often some of the strangest ICD-10 codes—from W2202 (“Walked into a lamppost”) to W6132 (“Struck by chicken”)—are actually used. We found this category particularly perplexing. Walked into a piece of furniture? Sure. Walked into a wall? Yeah, could see that happening. But accidental bite by another person? Doesn’t really seem like an accident to me… but, hey, if ICD-10 has taught us anything, it’s that anything is possible. To put things in context, the most common “exposure to mechanical force” cause of injury code we saw was W57 (“Bitten or stung by nonvenomous insect and other nonvenomous arthropods”), which happened to 529,000 patients in 2016. Most if not all of these are likely bee stings, which makes sense as bees cause a lot of doctor visits (think allergic reactions). The next most common cause of injury involving animals was W540 (“Bitten by dog”), with 162,100 diagnoses in 2016. Not too surprising. Things only get really interesting when you get to the bottom of the list—those affecting fewer than 2,000 patients. Then, suddenly, livestock make an appearance. Leave it to ICD-10 to make the word “contact” simultaneously vague and incredibly specific. Almost 9,000 patients were diagnosed with “Contact with workbench tool” in 2016, which leaves me with so many questions. Worse? 2,200 patients were diagnosed with “Contact with nail gun,” and 3,400 were diagnosed with “Contact with powered lawn mower.” Ouch. We’re not sure what’s going on with the 600 patients who were diagnosed with “Contact with sword or dagger.” Game of Thrones enthusiasts, perhaps? For every sports season, there is a ball that will hurt you. So we weren’t too surprised to find that injuries from baseballs, basketballs, and footballs roughly line up with each sport’s season. Baseball injuries peaked in May, while basketball injuries died down in the summer, and football injuries picked up in the fall. To be clear: these are injuries caused by the actual baseballs, basketballs, and footballs themselves—not just injuries related to the sport. As with any analysis of health insurance claims, it’s important to note that out in the wild, coding errors happen. 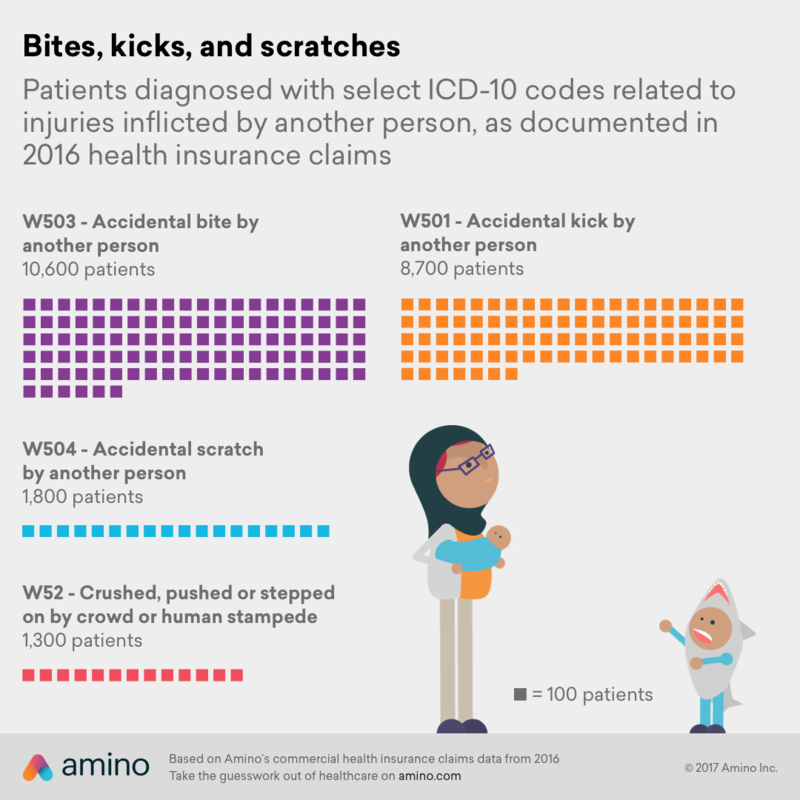 It’s possible that some of the more rare cause of injury codes (with low patient counts) are documented by doctors in error, which happens more often than you’d think.